Roelof Botha says the activity level in the building and construction sectors is improving. In sharp contrast to the gloomy picture painted by some of the country’s largest construction companies, SA’s building sector appears to be improving, according to the latest Afrimat Construction Index. The index tracks the level of activity in the building and construction sectors. Economist Roelof Botha, who is the author of the index, says the construction industry’s activity levels improved 3.7% in the third quarter, compared with the preceding period. 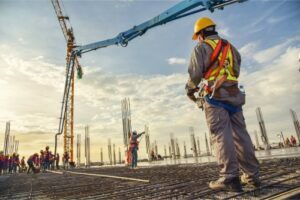 Botha said this reflected the recovery of the level of activity in the South African construction sector, with all of the eight constituent indicators recording gains over the second quarter. The constituent indicators include employment, salaries and wages, retail trade sales, buildings completed, building materials, construction value added and building plans passed. The index has improved by 17.6% since the first quarter of 2011, compared to an 11.2% increase inGDP over the same period. Botha said the problems experienced by a handful of listed construction companies were not representative of the state of the entire sector. He said the best performers during the third quarter were the value of hardware sales, the value of buildings completed and building plans passed in the country’s larger municipalities as well as the volume of building materials produced. Since the fourth quarter of 2016, the index has been declining. Botha attributed the decline to lethargic economic growth, high interest rates, policy uncertainty and drought in the Western Cape. “The good thing is that the economy is still growing, but at a slower pace. It is not as if the economy is shrinking. The size of the pie is only growing marginally,” Botha said. He said the fourth quarter was traditionally a hive of activity “because there is usually a rush before the construction industry closes for the year. Hardware sales also spike because of renovations usually done at the end of the year”, he said. He said the construction sector was poised for strong growth in 2019 especially after the general elections as the government was expected to lift the veil of policy uncertainty in a number of areas such as land reform. “I expect high levels of activity in the second half of next year,” he said. But Botha was critical of the recent interest rate hike, saying such a move was self-defeating. Botha slammed the Reserve Bank’s decision in November to hike the repo rate by 25 basis points to 6.75%. “I am terribly concerned about the Monetary Policy Committee (MPC). How can they increase interest rates when it is clear that there is no excess demand in the economy?” Botha said. He said high interest rates were not going to curb inflation which was mainly fuelled by high administered prices, especially the fuel prices and “to some extent” the weaker rand. “Raising interest rates in this environment is like spitting in the wind,” Botha said.